So said Jon Bannenberg some forty years ago, almost certainly to a roomful of Dutch shipbuilders. They may, or may not, have held it against him ( they were allegedly the source of the story that a Bannenberg yacht cost 50% more than any other designer’s ) but it wouldn’t have made much difference to him. Jon’s entire design life was about overturning conventions and the “normal way”. The list of famous yachts which came from his board is long, and includes Carinthia VI, numerous MY Gails, Nabila, Azteca & Paraiso, The Highlander, Coral Island, Limitless, Siran, Talitha, Thunder and Rising Sun. To name just a few. Not forgetting aircraft, houses, hotels, galleries, cruise liners. And a dentist’s surgery. He was appointed a Royal Designer for Industry in 1978, along with photographers The Earl of Snowdon and Bill Brandt. He was the first yacht designer to be so honoured since Charles Nicholson in 1944. We, at Bannenberg & Rowell, strive to honour his memory. After arriving in London from Australia in the mid-fifties, Jon patched a living together with theatre set design and dabbling in the decorative world, supported by playing the piano in bars and clubs. In the late-fifties, he set up Marble & Lemon, (a company named after two substances he thought sounded nice together) selling decorative antiques, in Cheval Place, Knightsbridge. The early 1960s saw Jon in partnership with the celebrated Bond Street antiques dealer Frank Partridge, when he would design interiors for Partridge’s clients. From working initially with London residences, Jon set up on his own, moving quickly onto homes in Greece and beyond, and thence to yachts, including his first project, the sailing yacht Tiawana. A decade of huge variety; from yachts to chalets, casinos to airline liveries, and the beginning of a long and enduring partnership with Heron which would see over ten yachts designed over the following years. Carinthia VI, perhaps the most iconic of all modern yachts, came off his drawing board and was built at Lürssen based on a frigate hull. By the 1980s, Jon’s reputation was firmly established, and operating out of his studio in Burnsall Street, Chelsea, he was designing yachts for the most high-profile individuals across the globe including Nabila for Adnan Khashoggi, The Highlander for Malcolm Forbes and Lady Ghislaine for Robert Maxwell. Aircraft, houses and hotels continued to form part of an exclusive portfolio. The high-water mark of a decade-long collaboration with the Oceanfast yard in Western Australia with a succession of ground-breaking yachts including Moecca and Thunder. During the same decade, from the other side of the world, Talitha G and Siran appeared at the other end of the design spectrum. For good measure, Jon created designs for a replacement Royal Yacht. What were to prove the final two years of Jon’s long and hugely distinguished career saw the completion of his exterior design and interior layout for Rising Sun although he would not live to see her launched at Lurssen in 2004. 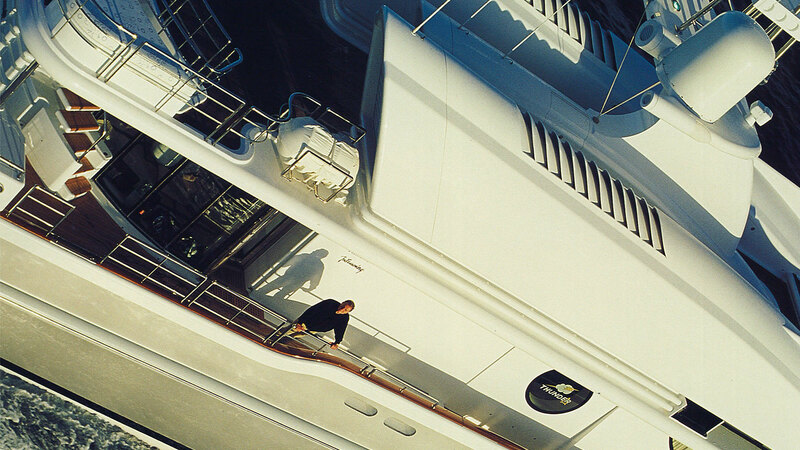 Multiple, his radical 50m design at Benetti, was launched on 13 April 2002, a little over a month before he died. Over a life in design of over forty years, some two hundred yachts came off Jon’s drawing board ( which still sits in the B&R studio today). He wasn’t one for awards, and they were in their infancy in those decades. Instead, his legacy is, and always will be, unmatched. Bannenberg & Rowell supports a scholarship at the Royal College of Art in his name. Fifty years after Jon was appointed a designer on the QE2, his son Dickie chronicles that remarkable design journey encompassing the piano bars of Sydney, London of the 60s and shipyards and billionaires across the world. This transaction is completed with PayPal – The safer, easier way to pay online. A PayPal account is not required.